Applying for a permit ensures that the natural system on or adjacent to your property is effectively protected and managed, and that you are meeting all the legal and legislative policy requirements. A TRCA permit is required under the applicable Building Code Act legislation, meaning that you need to have your permit BEFORE receiving a building permit from your municipality. Toronto and Region Conservation’s permitting process is mandated under Section 28 of the Conservation Authorities Act. The Regulation administered by TRCA is Ontario Regulation 166/06: Development, Interference with Wetlands and Alterations to Shorelines and Watercourses. 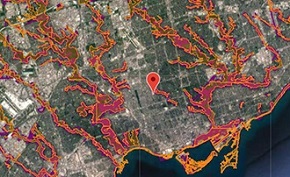 Ontario Regulation 166/06 is important because it protects watercourses, wetlands, shorelines and valley lands — and it protects you and your neighbours from flooding, erosion and loss of greenspace. If you are filling, changing grade, or building anything on a property within a regulated area, you need a permit from TRCA. Straightening, changing, diverting or interfering in any way with the existing channel of a river, creek, stream or watercourse, or for changing or interfering in any way with a wetland. Development, if in the opinion of the authority, the control of flooding, erosion, dynamic beaches or pollution or the conservation of land may be affected by the development. Identifying how your proposal is affected by TRCA’s programs and policies. Identifying potential issues, constraints and study requirements. Informing you of what lies ahead in the permitting process, determining whether your proposal is supported in principle and what the anticipated processing timelines will be. Determining the limits of the natural features through a site visit, if required. The submission of a complete application gives us an opportunity to review your application in a comprehensive, efficient and timely manner. Incomplete applications are not subject to our targeted review timelines and will delay the process. Please note that it is the responsibility of an applicant to undertake due diligence to determine all required planning and permitting approvals. To ensure the interests of TRCA are met, and to appropriately assess the technical aspects of your proposal, we require the submission of a number of information items with your permit application. Please note that the scale and complexity of your proposal will determine which of the studies, reports or design drawings will be needed for your application. For example, to replace a deck on a steep slope will require an engineering study whereas a new house set well back from the slope may not. A listing of potential studies that may be required can be found in the downloadable document directly below. The level of detail required for most of the studies and reports can vary widely depending on the property and the proposal. In some situations, a single-page letter from a qualified expert will be sufficient, while in other cases a major study will be necessary. This checklist has been compiled by the Toronto and Region Conservation Authority to assist applicants in the preparation of a complete planning application or a complete permit application pursuant to Ontario Regulation 166/06. Meeting with a TRCA Planner prior to submitting your permit application will help determine which items must be provided to consider your application complete and to establish the requirements for, and the scope of, any studies, reports or design drawings. The TRCA checklists and technical guidelines should be consulted in preparation of your permit application. Submitting the relevant documents, plans and/or reports allows TRCA staff to effectively review the proposed works and determine if they meet the requirements of Ontario Regulation 166/06 and the TRCA’s Living City Policies. Permissions that are consistent with TRCA approved policies and procedures. Permissions that are for a time period of two years or less. Permissions for one-time extension, provided the time period is two years or less. This initiative enables permits to be approved by designated staff and allows applicants to proceed within a timely manner rather than having to wait for monthly permit approval by the TRCA Executive Committee. The review process still ensures compliance with our legal obligations under the Regulation. Major projects that are significant in geographical area and/or for which submission of a suite of technical studies is required to demonstrate consistency with TRCA policies; these generally require more complex technical review and assessment. Permissions that extend beyond two years, up to a maximum of 60 months. Permissions for a one-time extension that extends beyond two years, up to a maximum of 60 months. The Executive Committee generally meets on the first Friday of each month. Written confirmation that the project is unchanged and the plans and documents detailing the works are identical to those stamped approved by TRCA as part of the original permit. If minor modifications in keeping with the original permit are proposed, then a cover letter detailing the modifications and new plans or documents must be submitted. Property ownership as per the original permit is the same. A permit re-issuance fee is provided. Please contact the Planner for your municipality.